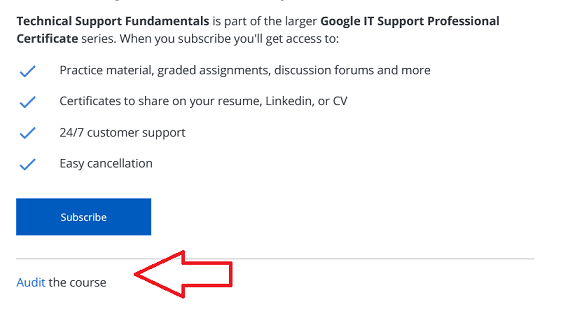 Can I Audit a course of a Professional Certificate (Google IT Support Professional Certificate) and after enroll for pay and get my certificate? The idea is first start with try one course of the five course of the program Professional Certificate (Google IT Support Professional Certificate) and then i will enroll in the full program for get the Certificate. But, after i can complete all the course and get the certificate. Sure, you can start a subscription to a single course or the entire Specialization whenever you like. Once you enroll in the audit mode, it shows you a banner like this on the course page. When you click it, you will be taken to the home page of the Specialization. Then you will need to subscribe. Also, upon opening a quiz page in the course, you see such a button. It invites you to subscribe. Thank you for this detailed answer, @Maryam!